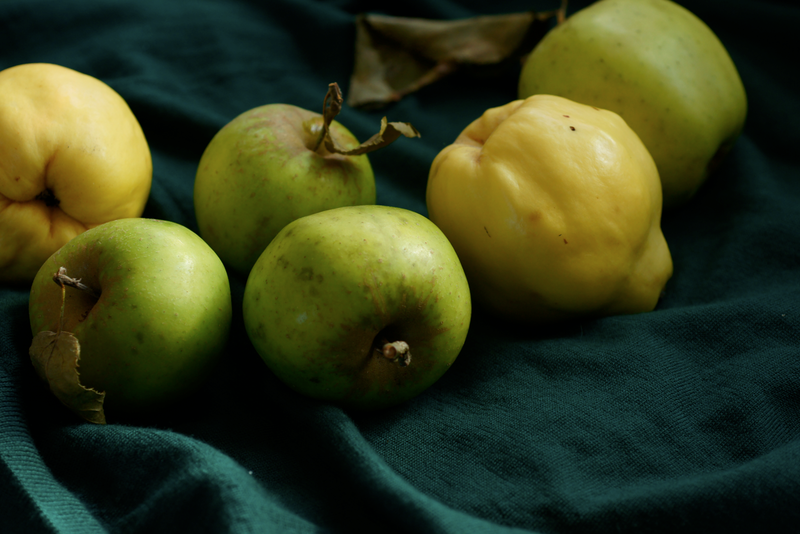 When I bought a few quinces at the market two weeks ago, I spent some time reading up on how to use them. For my first taste I chose buttered quince. Yet I kept on coming across the idea of using quince in an apple pie. I found Jane Grigson claiming that quince adds more to the flavour than anything else, Nigel Slater raving about the "extraordinary perfume" it adds, The Flavour Thesaurus explaining how it couldn't be beaten as a combination. Pie was already on my 'to do' list. I've made plenty of tarts, galettes and other combinations of pastry and fruit, but never a traditional pie. This seemed like the perfect time. 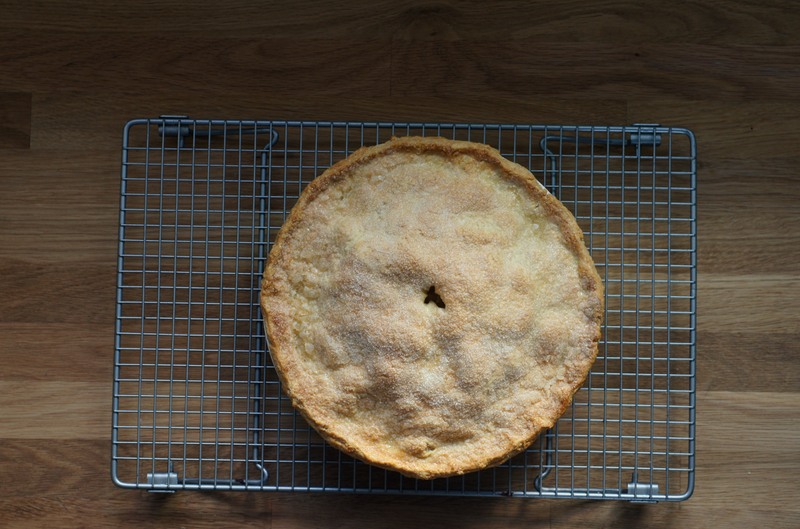 I bought a pie dish on an crisp early morning walk then came home to make this pie. I can see where my books were coming from. 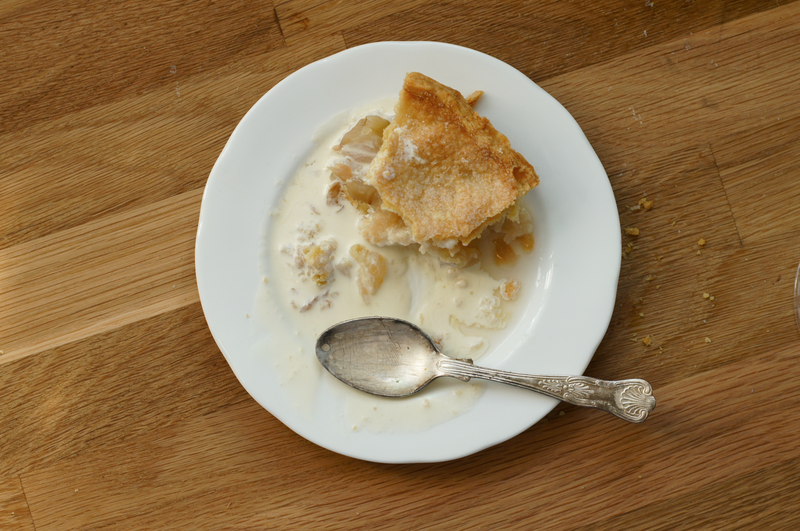 Underneath the crisp pastry crust lay the most delicious filling, creamy gold and flecked with the rose of the quince. The steam that rose from the pie had the most intoxicating smell. The scent of a quince is possibly its most distinctive feature. I was finding it very hard to describe until I came across this description in The Flavour Thesaurus: "apple, pear, rose and honey with a musky, tropical depth". The taste echoes the smell. Make sure you eat this warm with plenty of chilled double cream. It's glorious. I had to go back for seconds. Sometimes the best desserts are not complex Michelin-starred creations but simple classics. Sieve the flour, salt and sugar into a bowl. In another bowl, whisk the egg, milk and vanilla together. Place the cubed butter into the flour bowl and rub the butter into the flour until it resembles wet sand. Add the egg mix in one go and mix with a knife. Pull together with your hands. Tip onto a surface and squish with the palm of your hand a few times to combine. Wrap in cling film and chill for at least 30 minutes. Preheat the oven to 220C**. Pour the water into a bowl and add the lemon juice. 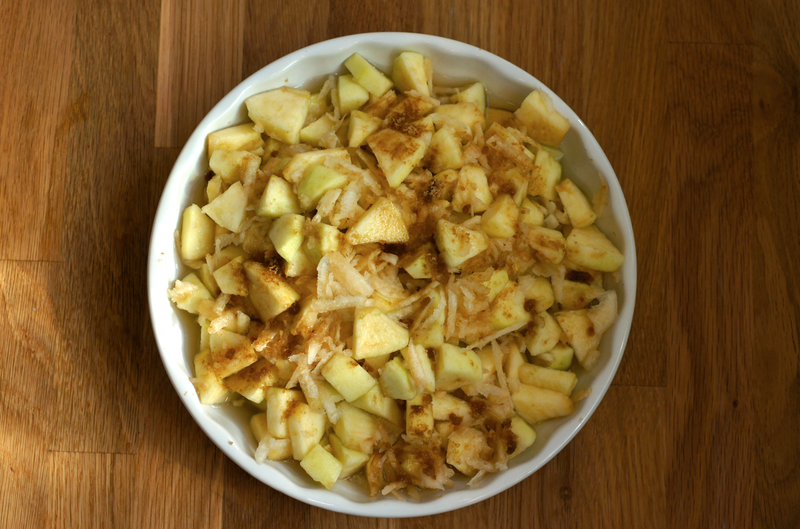 Peel, core and chop the apples into small chunks and place them into the water. Peel the quince, then chop into 4, cut the core out and immerse three pieces. Grate the 1/4 back into the bowl and then repeat with the other three, mixing as you go. 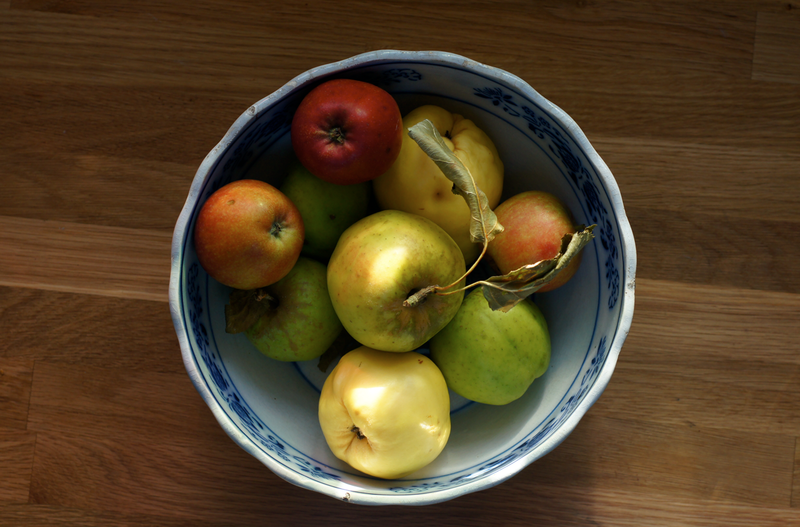 Place a sieve over a bowl and drain the fruit, making sure you keep the water. Arrange 1/3 of the fruit into a 9" pie dish then sprinkle a tablespoon of the sugar over the top. Add another 1/3 and tablespoon, then repeat again. Pour 250ml of the water into the dish at the side, trying not to wash the sugar out of place. Roll out the pastry into a circle roughly 12". Cut strips off from around the edge and press along the edge of the pie dish. Brush with a little of the extra water. Roll the pastry over the pin and place over the top of the pie. Press down over the top and then trim the edges. Crimp the edges to seal them and then use a knife to cut a steam hole in the top. Brush the top with some of the extra water and then sprinkle with caster sugar. Place into the oven and bake for 15 minutes. Turn down to 190C** and bake for another 30 minutes. Leave to cool on a rack. Eat hot or warm with plenty of cold cream. *If you can't find a quince, you can use roughly the same weight of a sweet apple such as a cox - you won't get the quince perfume but it will still be a lovely apple pie. **Edit 22/11/15: I've just made this again and the baking temperatures seem a bit off, but I sadly haven't had time to re-test them. I think I'd go for 200C put down to 170C another time. I also had a bit too much quince as mine was quite large - I think I might go for half next time, as it was quite overwhelming. What a beautiful post! I would love to have tasted that pie. The steam looks good in colour as well as in the black and white photos. From what you say, it tastes like heaven ! That first shot is absolutely gorgeous! 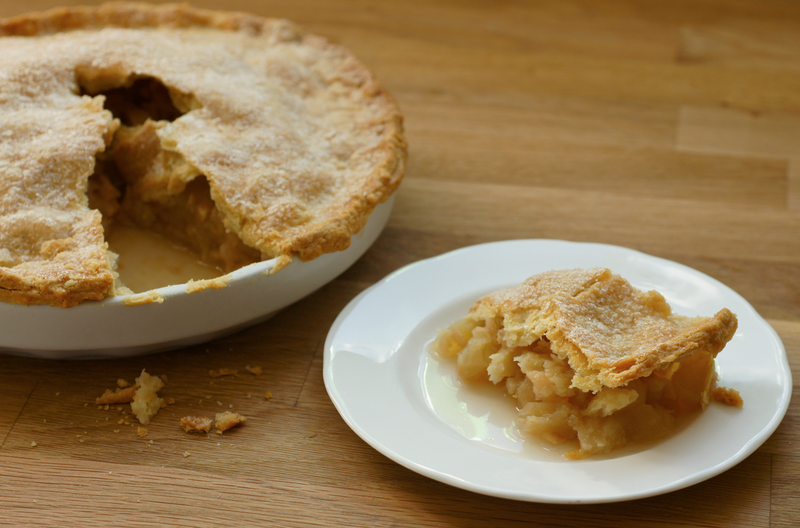 Nothing says fall like a fresh apple pie. LOVE that wisp of steam in the first photo! Perfect! 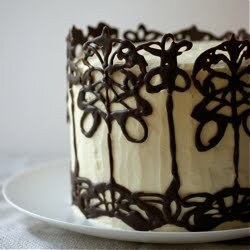 Mum - Thanks :) I'd make you one when I come home but I doubt we could find a quince! argone - It is pretty heavenly! It feels very autumnal, you're right. Jolene - Thanks! I couldn't believe how much steam came out of it when I took it out of the oven. Steph - I couldn't believe my luck when I took it out and it looked so awesome with the steam. Photographic praise from you is extra special! You're right about that. The simple classics are the best! Emma - you are magic with a camera. The shot of the steam rising from the pie deserves an award! Well done. Yadsia - Though I love eating in fancy restaurants, I often find the puddings the most disappointing part - such a shame. Wish they'd just stick to something classic and do it well! Gretchen - Thank you! We must go for that coffee soon. maigo - Aw, thank you! Glad you like it. 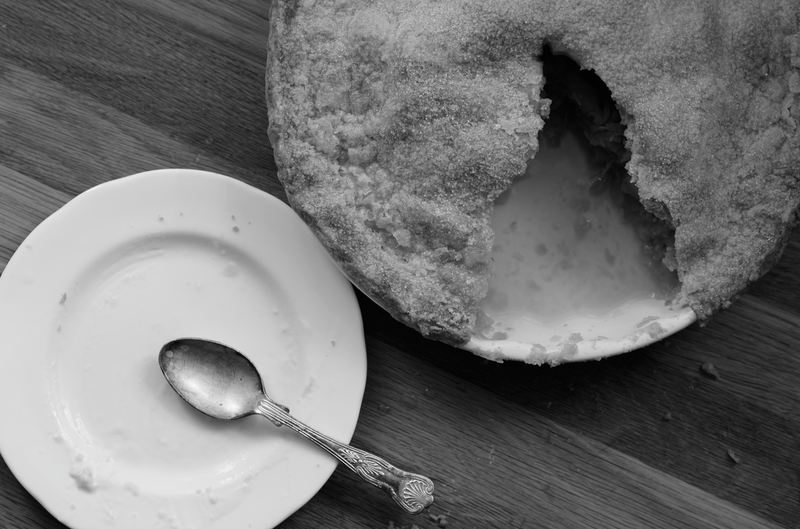 Emma, I've seen a lot of apple pies online, but yours, the crust is just.... well, it made me jump to the recipe. In agreement with Steph, that first photo is gem. Kiran - How exciting, I hope your first pie goes well! pickyin - I'm so glad you like it! Do try it out.